Thin black band surrounding a crisp white iris. On its own, this can finish a costume. ColourVue White Zombie contact lenses are extremely popular especially among fans of the zombie theme. 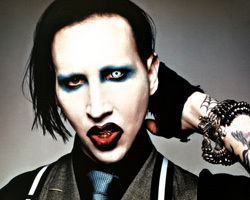 They can be seen not only at Halloween parties but also as part of the stage persona some artists, such as Brian Hugh Warner, the lead singer of the band Marilyn Manson. The black edge of the contact lens and the inner white colouring give a freaky effect, very bizzare, kind of dead effect. Perfect accessory for any kind of costume party or horror themed event. These contacts are also fantastic for comfort - they feel great and can be worn for a whole day with ease.